If you are looking to clear long grass, tall weeds and tackle overgrown areas that are too much for a conventional lawnmower then consider a Wheeled Trimmer / Strimmer Mower. Instead of tackling with a brushcutter or hand held strimmer they will tackle the job much more quickly and with less effort. Ideal for clearing large areas. The Cobra Wheeled Grass Trimmer is a powerful, well balanced, heavy duty machine designed to cut dow.. This Premier Trimmer Mower offers much more power than any handheld trimmer or brushcutter and will .. The impressive DR TR4 Premier Wheeled Trimmer-Mower is ideal for efficiently tackling borders, lawn .. The DR TR4 PRO is a superbly well engineered wheeled trimmer from DR and will scythe effortlessly th.. 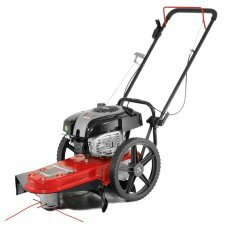 This DR TR4 Pro XL Wheeled Trimmer Mower will make light work of the most demanding terrain.Leave yo..